We mentioned Thursday night that we're big fans of Chip Kelly and the team he built at Oregon in his four years as head coach. We also mentioned that the Fiesta Bowl—which Oregon won, 35-17, over Kansas State—would probably be Kelly's Ducks' last hurrah. 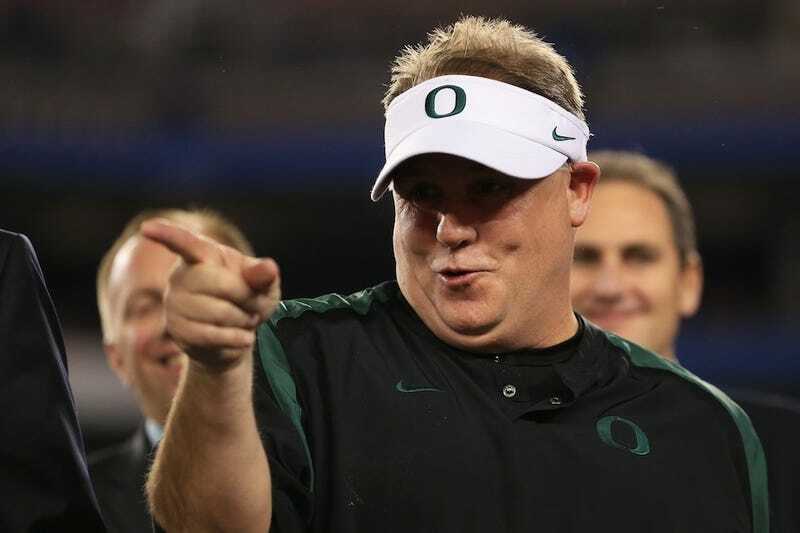 Tonight Is Probably Your Last Chance To Watch Chip Kelly&apos;s Oregon Ducks. Don&apos;t Miss It. Indeed it was, according to NFL.com's Ian Rapoport. He says Kelly is close to a deal to become the Cleveland Browns' next head coach. The young, developing Browns are as good a fit as Kelly might find: Trent Richardson easily slides into his system, and Josh Gordon will stretch defenses and open up the middle of the field. Brandon Weeden probably can't start for Kelly, but, uh, did the Browns expect a different outcome? Perhaps Kelly will find someone in the draft. Or maybe this is Thad "The Champ" Lewis's biggest break. Update (6:55 p.m.): Brandon Weeden retweeted this dude. Browns fans are not a hopeful bunch, and recent NFL history offers many cautionary tales of hotshot college coaches failing in the pros. But they ought at least to take solace in this: Last time their brass went looking for a coach, they hired the coordinator behind the Rams' bad offense. This time around, they grabbed the best available candidate. Even if the coach doesn't improve after a change, at least ownership has.